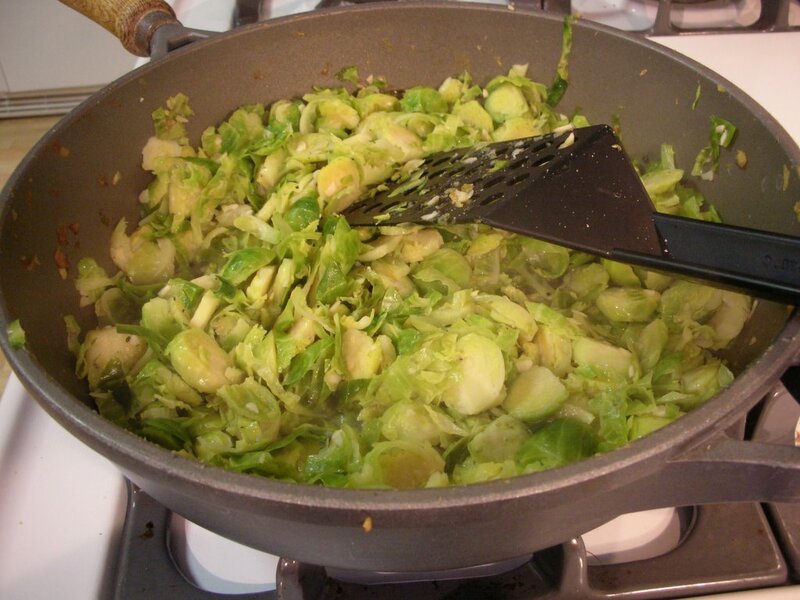 After I suffered a bad batch of Brussels sprouts a few weeks ago, my friend Cindy wrote, "I grew up on frozen then overcooked Brussels sprouts. I did not like them. Even our dog wouldn't eat them. Then Gregg and I were in San Francisco and the special veggie was Brussels sprouts and the waiter assured us they were fresh and delicious and encouraged us to try them. We did and they WERE great!" Tonight I cooked Cindy's simple sprouts and do absolutely agree: they are very good, not over-the-top fine-chocolate good but plain, simple fare that nourishes and satisfies. Once again, however, the 15 minutes it takes to trim (and in this case then slice) the Brussels sprouts seems interminable on a weeknight. Next time, I'll definitely pull out the food processor for the slicing job. Clean and slice the sprouts. Melt the butter in a large, deep skillet until shimmery over MEDIUM. Add the sliced sprouts in two or three batches, stirring well to coat with butter. Cook, stirring occasionally, until soft and fragrant, about 30 minutes, adding water as needed to prevent burning. Season liberally with salt and pepper. Serve and enjoy!